Jolted by low prices of shrimp which had plunged below the production cost last year due to a glut in global production and uncertainty in world trade, the shrimp farmers are shying away from replenishing stocks. Stocking of shrimps in states like Andhra Pradesh, Tamil Nadu and Odisha is down by about 40 per cent compared to the February-March period last year. “The farmers had sustained a loss in shrimp farming by selling the output at Rs 100 less per kilogram last year. Many ponds are lying unutilized in Odisha and Andhra Pradesh in this cropping season as they have gone for low stocking this year. Now they (farmers) are asking for assured returns from the exporters to do the farming,” said an exporter. “Exporters are also not getting remunerative returns from exports. We are also finding it difficult to send cargoes with so many restrictive trade practices adopted by counties like US and the European Union,” he added. While seafood exports crossed $7 billion in the last fiscal, trade sources are expecting a fall in the quantity and value of exports this year. The stocking in major shrimp producing states of Andhra Pardesh and Tamil Nadu has dropped due to price issues, seed qualitiy and disease. “At current prices, if farmers go for farming, they will make losses,” said Durai Murugan, secretary of Shrimp Association of Pattukottai, Tamil Nadu, and managing director of New Diamond Aqua Enterprise. 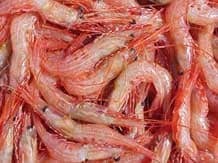 For 100 count shrimp, prices are hovering at Rs 200 against the production cost of about Rs 240-250, forcing the farmers to incur a loss of Rs 40-50. A strong uptick in major shrimp production since 2017 has intensified competition amongst leading global shrimp exporting nations. According to rating agency ICRA, the increasing shrimp production amongst the top shrimp producing nations is likely to cause demand supply mismatches leading to volatility in prices.